It's been a loooong time, hasn't it? Finally, I'm back with you, and I will share with you later on what has been going on, but for now I'd like to get to some food, since it's been a while. Before I do move on to foodie goodness, however, I do want to sincerely thank those of you that left thoughtful notes and sent caring e-mails. I was touched by the kind sentiments, and grateful to have that goodness sent my way. I haven't been cooking much the last couple of months, just getting basic meals on the table most nights. Nevertheless, I do have quite a few pics on file from the summer to share with you. *As a side note, speaking of getting meals on the table, these last few months I have been stunned at how much our 7 year old can now eat! Parents always speak of how much food teenagers (especially when active) consume, and I think I am getting a glimpse into those years. Our daughter inhales food at dinner hour, and her lunch comes back from school with not a morsel remaining. Hubby and I remember when she was a preschooler and we'd be highly irked watching her pick and nibble at every meal, as if it was a chore to eat. At the time, we thought she'd always be that way. Now, I notice myself planning a meal thinking "will this be enough? ", since she can eat more than me most nights, and almost as much as hubby! Youthful metabolism, gotta' love it! Getting back on track and back to food... This is a new recipe that I finished at the end of summer. It is a Coconut Lavender Vanilla Bean Panna cotta. Quite breezy to make, and creamy without being overly rich. Yes, I have been working on many new recipes, and so I've decided to groom them for a new project. I don't have details to share just yet, but will let you know when I do! Good to be back with you guys... I'll have more soon! Happy cooking! Vegan Pannacotta?! O my, I would love to try that. I can't wait to hear about your new project! So glad you are back, Dreena! You've been missed. I hope your secret project is with the Food Network! Good to have you back, Dreena! hope life is going alright for you. So glad you are back! I've been glancing at your blog every day to see if there's anything new, and today was such a pleasant surprise!! Hope everything is well with you and your family. Panncotta? You are speaking directly to me! so nice to see you posting again! i hope you've been able to relax these past few months and just cook whatever you feel like! the panna cotta sounds wonderful. i've never had a regular panna cotta, but i can't wait to see the recipe for this one. I recently subscribed to your feed (and am new to veganism) and eagerly await your updates! That dessert looks wonderful! That panna cotta will warm the bottom of my Italian hubby's heart. Mine too! Oooooh, that panna cotta sounds wonderful! 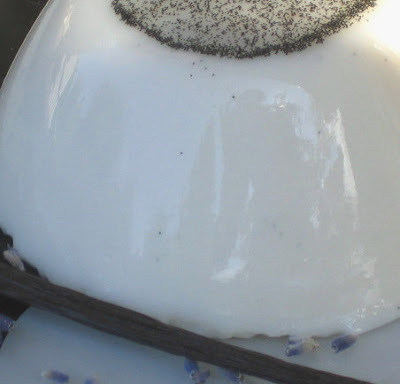 Coconut, lavender and vanilla together must be lovely! I'm glad you're back, and are doing okay. And that panna cotta looks yum! I hear you about kids eating alot. My kids go through stages where they seem to eat nothing for weeks and then all of the sudden they are eating seconds and thirds. I use to never have to worry about leftovers for dh to take to work, now I have to almost cook just for work. LOL. I am really scared to see my food bill when I have 3 teenagers in the house at one time. Please post the panna cotta recipe soon; it's impossible to find one without gelatin!